become excited almost always wheeze. Maximilian's are the two species that are best as talkers. Pionus are good pet birds when children are around. 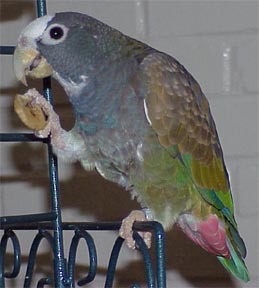 Pionus come from Latin America. All Pionus are a bit stocky with a short square tail. Pionus are very obedient and not as hard headed as many other parrots. Pionus are monomorphic, meaning males and females look the same. In general, the males are a bit more aggressive in behavior. to help keep a Pionus' feet healthy. Pionus should always have access to clean, fresh water.